Stop Loss - What Does It Mean? What is a "stop loss"? 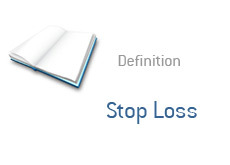 What is the definition of the term "stop loss" as it applies to trading? In trading, a "stop" is a price (mental or otherwise) at which a certain action will take place. "I have a mental stop on MSFT at $35 - if it hits that price, I will buy more." Well, a "stop loss" is a price at which losses in a position will automatically be limited. For instance - let's say that you buy MSFT at $35. "I will set a stop loss at $34." In this case, you would be looking to exit your position if MSFT hit $34. Any online brokerage will have the capability to set your own stop losses. If the price of a stock hits a certain point, the stop loss will be triggered and a sell order will be initiated. Some people prefer to set "mental stops" - these are stops that are strictly in a person's head. So, if a person had a "mental stop" at $34 on MSFT, then they would need to enter their sell order themselves if the stock hit that price. The bottom line - a stop loss is a mechanism in which a person seeks to limit their losses in a position.